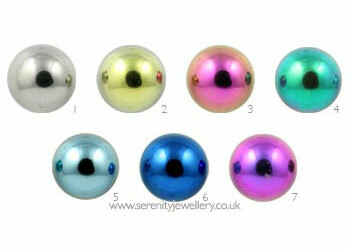 Hypoallergenic titanium 4mm and 5mm clip-in balls. 11mm BCRs use 5mm balls, 8mm BCRs use 4mm balls. Compatible with the appropriate size BCRs. PLEASE NOTE this item is the clip-in ball only not a complete BCR. The blue ones were darker than I anticipated, but work lovely with silver hoops. I bought the dark blue ones to be able to add some colour to the gold-titanium BCRs I have. Takes some practice to learn how to pop them in, but it's well the effort. I'll buy some other colours as well.